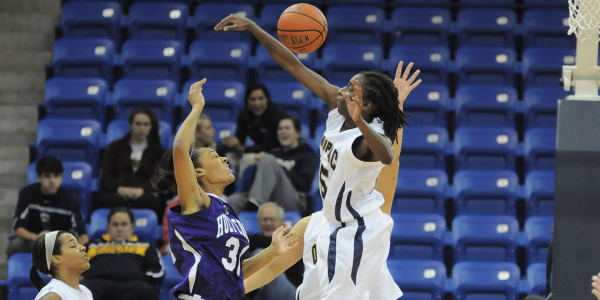 The Quinnipiac women’s basketball team continues its undefeated season with a 61-49 win over Holy Cross. Felicia Barron led the Bobcats balanced offensive showing with 13 points and six steals. Jasmine Martin added 12 points and Samantha Guastella chipped in 11. All Martin’s points came from behind the arc, while Guastella tallied three 3-pointers of her own. The Bobcats shot 33.3 percent for the game while shooting 30 percent from behind the arc. Quinnipiac improves to 7-0, the best record since becoming a Division I team. Although being outrebounded 52-40, the Bobcats commanded a lead the entire game and only gave up 11 second chance points. “We talked a lot about our rebounding, both offensively and defensively,” Fabbri said. “We’ve seemed to get our hands on a lot of balls but we’re not doing a good job bringing it in. Quinnipiac also dominated on the defensive end, recording 15 steals in the outing. Gillian Abshire and Brittany McQuain chimed in seven points apiece and McQuain grabbed nine rebounds while Abshire dished out five assists. Holy Cross now 4-5, was lead by Lisa Mifsud with 11 points and Brisje Malone with 10. The Bobcats look to grab their eighth win after a week off as they travel to take on the University of Hartford on the 16th.